Overall, it is a good product. It does what we wanted it to do. In the beginning it might be frustrating, but it will get better! flexibility and ease of use. The ability to manage and administrate changes in house is a time saving feature and allows for cost saving to pass along to our clients. The reports are top notch and easy to use. Inability to schedule reports and export in a format we can use. Crystal viewer is the only platform which we cannot support. With other systems we have been able to schedule and receive a PDF attachment. 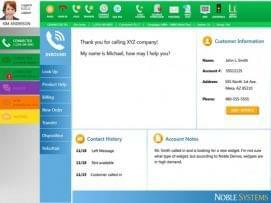 Noble has been able to fulfill development requirements other vendors could not. We are a clinical contact center and our use of the system varies based upon clinical study requirements. with other systems we were required to set up work around processes. To date with Noble work arounds are a thing of the past. flexibility and ease of use. The ability to manage and administrate changes in house is a time saving feature and allows for cost saving to pass along to our clients. The reports are top notch and easy to use. Inability to schedule reports and export in a format we can use. Crystal viewer is the only platform which we cannot support. With other systems we have been able to schedule and receive a PDF attachment. Noble has been able to fulfill development requirements other vendors could not. We are a clinical contact center and our use of the system varies based upon clinical study requirements. with other systems we were required to set up work around processes. To date with Noble work arounds are a thing of the past. Pros: The Noble solution suite offers nearly everything conceivable option across all functions of an integrated call center including ability to operate a variety of outbound campaign types, a seamless blending environment to optimize staffing to handle inbound demand and outbound needs. The agent screens offer a ton of options for dynamic customization based upon each record and loads of automation to remove repetitive tasks and reduce human error. Cons: With so many options, it can be daunting at the beginning to begin to assess and document how to go about starting down the path towards system deployment. I highly recommend utilizing the Noble U classes ahead of time to learn how the system fits all the modules together and to begin to grasp all of the system's functionalities. Based out of Atlanta, Georgia, Noble Systems has a long history of call center software innovation. With beginnings reaching back to 1985, President James K Noble discovered the unique benefits of utilizing predictive dialing solutions in his own call center operations. Recognizing how powerful these tools can be, he formed Noble Systems in 1989 to package and provide not only predictive dialer solutions, but eventually an entire Contact Center platform, utilizing VoIP and all the benefits that come with IP based telephony. Noble Systems offers a wide range of award winning products and solutions including both outbound and inbound as well as blended contact center solutions, with call management, agent desktops, digital recordings, IVR, messaging, IP and VoIP telephony and even omnichannel solutions. Their mission is to deliver industry leading, best-in-class solutions, as well as providing superior customer service to help achieve that ultimate level of customer satisfaction. 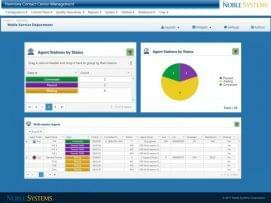 Beyond a robust and complete contact center platform, Noble Systems provides strategy planning as well as resource management and even compliance tools to ensure the platform and your agents are performing with the highest efficiency possible. Noble Systems solutions allow companies to communicate with their customers more effectively through multiple channels beyond just call center capabilities, including email, SMS, and web chat. With a long history ranging back to the 80’s, Noble Systems has an edge in this industry, with a deep understanding of not only what a contact center requires to perform at its peak efficiency, but also how to deliver the best performance and platform to their own customers. Their solutions have continuously won awards throughout the years with constant innovation and evolution of their product offerings over time. With the ability to deliver an entire contact center solution that expands beyond simple inbound calling, Noble Systems offers a very compelling platform that will meet the needs of just about any business of any size, from SMB to Enterprise organizations. Starting with their beginnings of outbound predictive dialers, Noble Systems has expanded to include Inbound calling functionality, which can be blended with outbound services to cover all the bases. Call management and workforce management solutions will help your contact center stay on top performance, providing your center with deep insights on where and how to improve in anyway. Building off of VoIP and even SIP telephony, Noble Systems has a solution that can fit in with what any organization needs, and can deliver the imperative features and functions that any call or contact center requires in this rapidly changing market. 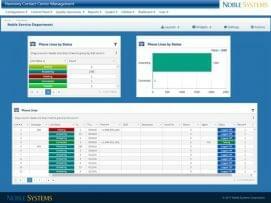 Noble Systems has kept ahead of the times, offering a complete omnichannel platform to expand a call center into a fully-fledged contact center with new forms of communications for customers and clients, including the previously mentioned web chat, as well as SMS and email support. Expanding into a complete contact center will allow your business to gain an upper-edge on the competition, as well as offering your clients the best service that they deserve — something that Noble Systems places a strong focus on themselves, as well. But beyond just a platform on which to communicate, Noble Systems also expands into both Workforce Management, Quality Management, and Performance Management solutions with features like call recording, and deep analytics to help your business understand and manage key aspects including the peak call hours, campaign management, automated decisioning, and speech analytics to maintain the highest level of quality possible. Noble Systems offers a complete and total contact center platform with just about every tool necessary to deliver the best possible service and support for any size business. What Do You Think of Noble Systems? Your last name & email will not be displayed. Would you recommend this provider? Are you currently an active user? To prepare your price quote, we'll need some information. Which of the following do you need? To prepare your demo, we'll need some information. How many lines you need?